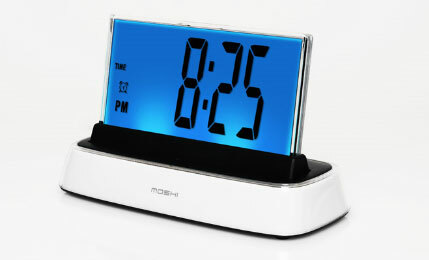 Moshi Voice Activated Alarm Clock Demands Early Morning Coherence | OhGizmo! By Evan Ackerman on 11/13/08 • Leave a comment! It’s not too often that an innovative alarm clock comes along (I said innovative, not gimmicky), but when it does, you can be sure it’s worth paying serious attention to. The Moshi IVR clock is one of these. Not only does it look nice, with a big bright backlit display and a stylish base, but it’s completely voice activated. Completely. Just say, “hello, Moshi” and it’ll respond with “hello, command please.” You can then verbally ask it what time it is, to turn the alarm on or off, toggle the backlight, check the temperature, set the time, or a bunch of other things. Seriously, there’s no need to get out of bed or even move your arms ever again, but if you need the exercise, it looks like there are some old-fashioned buttons in the back to program it the hard way. The greatest thing is, of course, the ability to turn the alarm off without opening your eyes, but it doesn’t seem like Moshi is likely to respond to profanity. I hope version 2 will be programmable to allow it to interpret my early morning (i.e. 11am) garbled mumbling. Somewhat surprisingly, the Moshi IVR clock costs only $50, available on the Moshi website, where you can also see and hear a demo of the voice activated functions of the clock while listening to soothing background music.